Tier 1. What are spatial distributions of stocks in the Columbia River Basin? How are these distributions changing over time? How do they relate to overall ecosystem status? Tier 2. 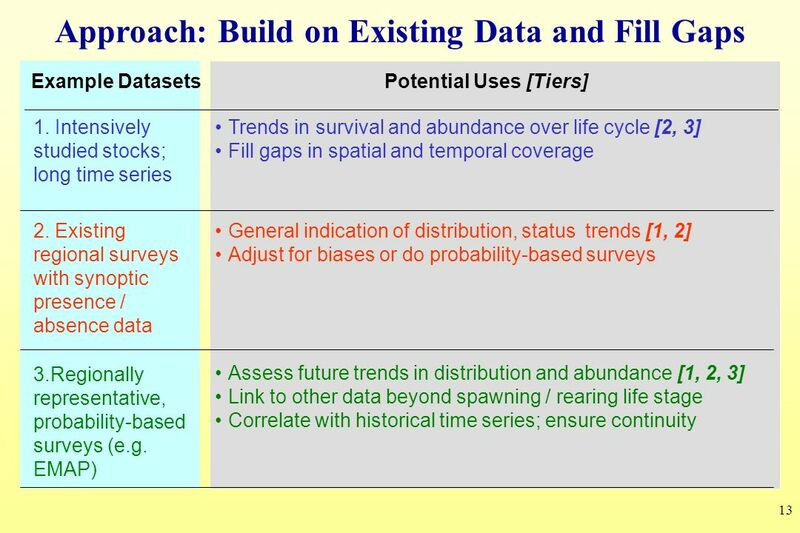 What are trends in stock abundance, condition and survival over whole life cycle, and at different life history stages? How do these relate to habitat and climate? Tier 3. 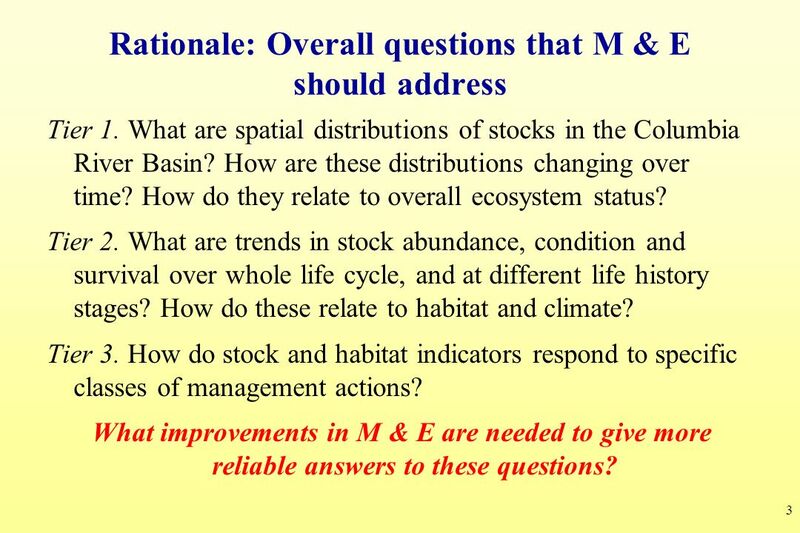 How do stock and habitat indicators respond to specific classes of management actions? 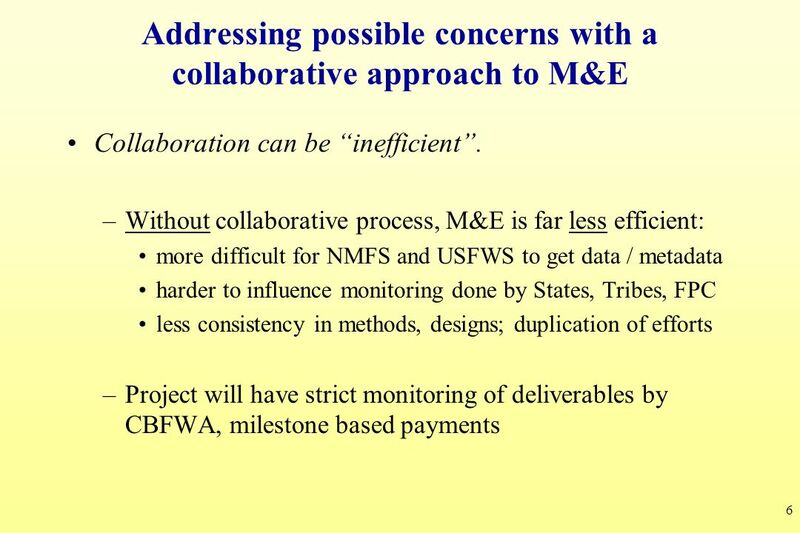 What improvements in M & E are needed to give more reliable answers to these questions? Will Core Group always reach consensus? Certainly not! 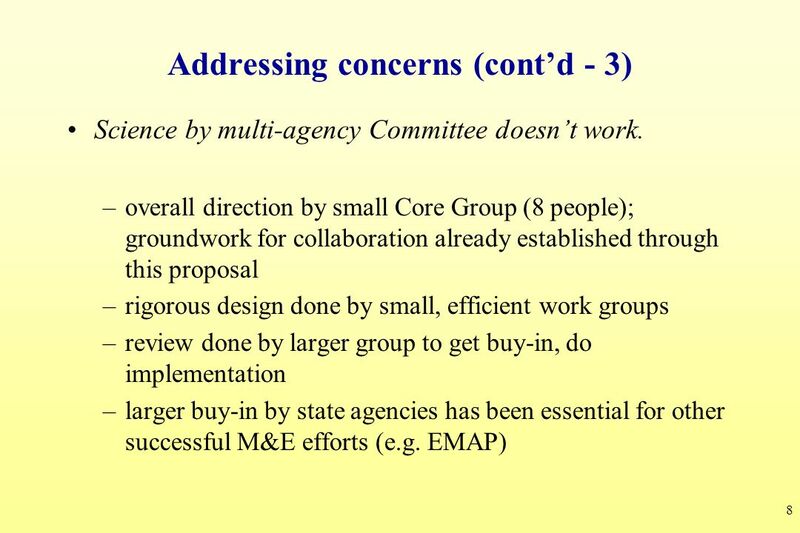 Consensus not required to make incremental progress on M&E. 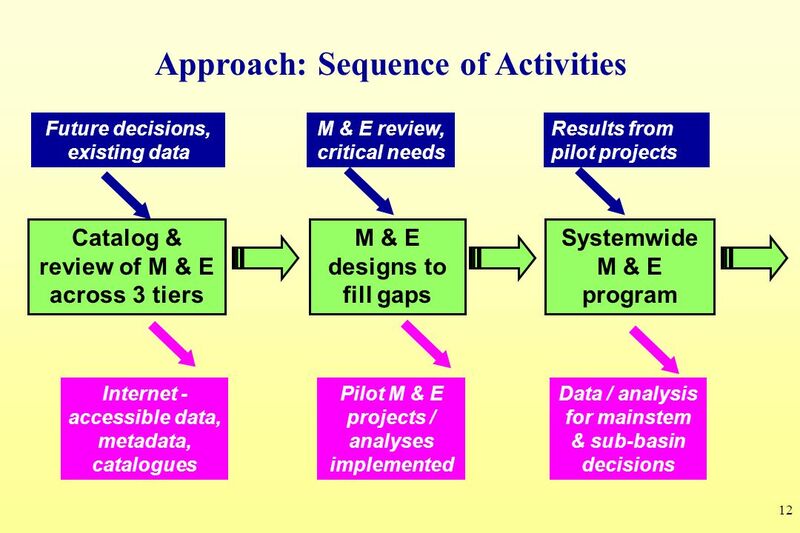 Can explore competing M&E approaches with pilot projects / analyses, rigorous inter-comparisons. 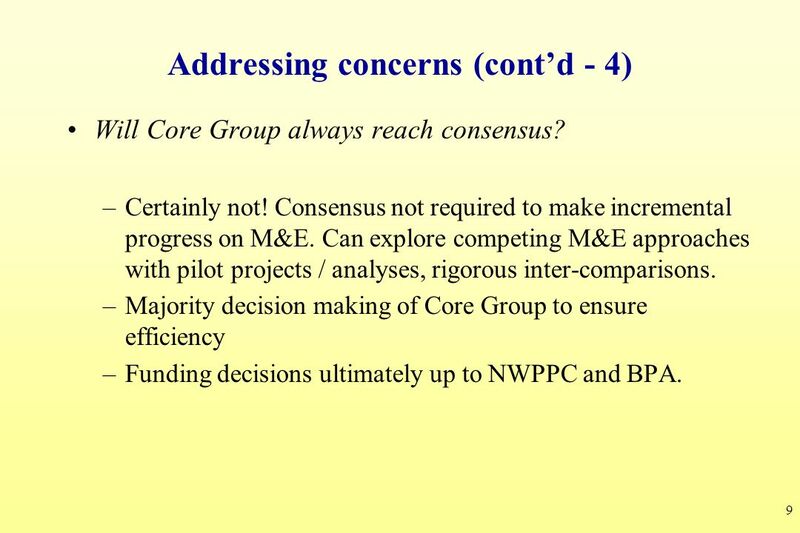 Majority decision making of Core Group to ensure efficiency Funding decisions ultimately up to NWPPC and BPA. 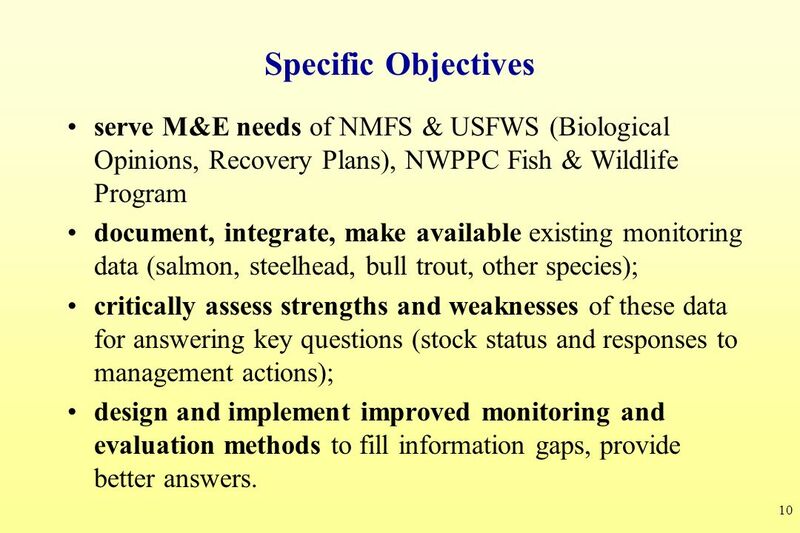 10 Specific Objectives serve M&E needs of NMFS & USFWS (Biological Opinions, Recovery Plans), NWPPC Fish & Wildlife Program document, integrate, make available existing monitoring data (salmon, steelhead, bull trout, other species); critically assess strengths and weaknesses of these data for answering key questions (stock status and responses to management actions); design and implement improved monitoring and evaluation methods to fill information gaps, provide better answers. 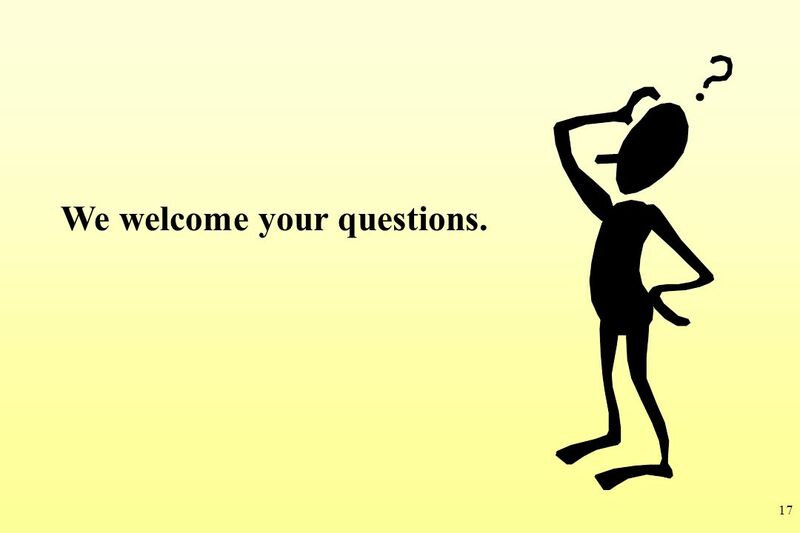 17 We welcome your questions. 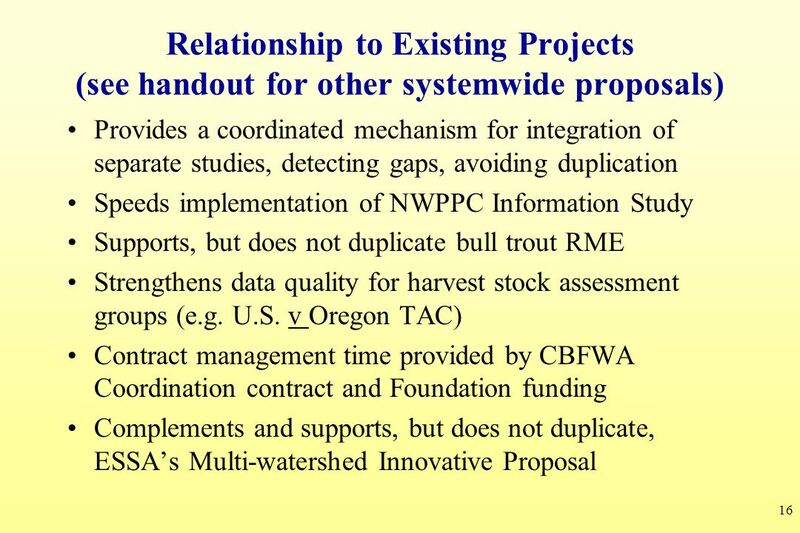 Download ppt "Collaborative, Systemwide Monitoring and Evaluation Program"
Monitoring Watershed Restoration Effectiveness Nez Perce Tribe DFRM-Watershed Division Rebecca A. Lloyd, Project Leader. 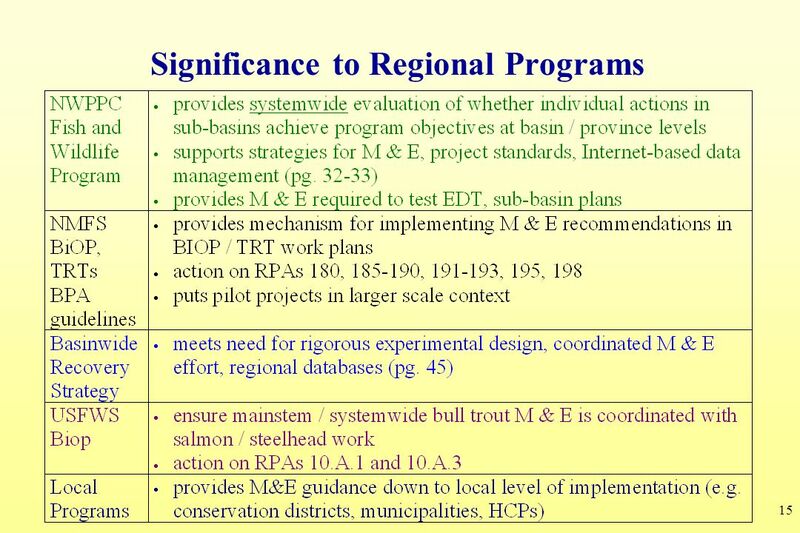 COMPARATIVE SURVIVAL STUDY (CSS) of PIT-tagged Spring/Summer Chinook and PIT-tagged Summer Steelhead CBFWA Implementation Review Mainstem/Systemwide. Implement the Grande Ronde Model Watershed Program Administration and Habitat Restoration Projects Project Lyle Kuchenbecker, Project Planner. Investigate Re-establishing Anadromous Fish Populations Above Man-made Barriers Oregon Department of Fish and Wildlife Willamette Basin. Assessment of A-run Steelhead population in the Clearwater Nez Perce Tribe Department of Fisheries Resources Management. 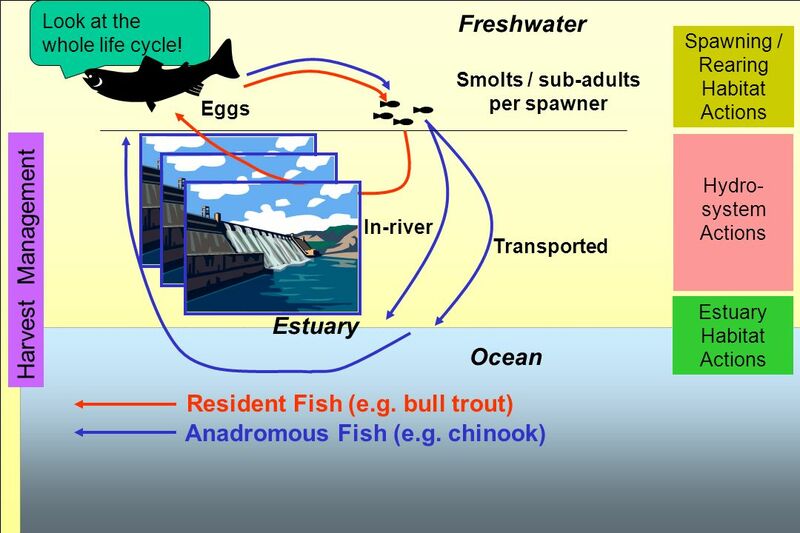 Salmonid Pathogens in the Columbia Cascade Province Frank Loge 1 Douglas Call 2 Michael Barber 1 1 Department of Civil and Environmental Engineering 2. 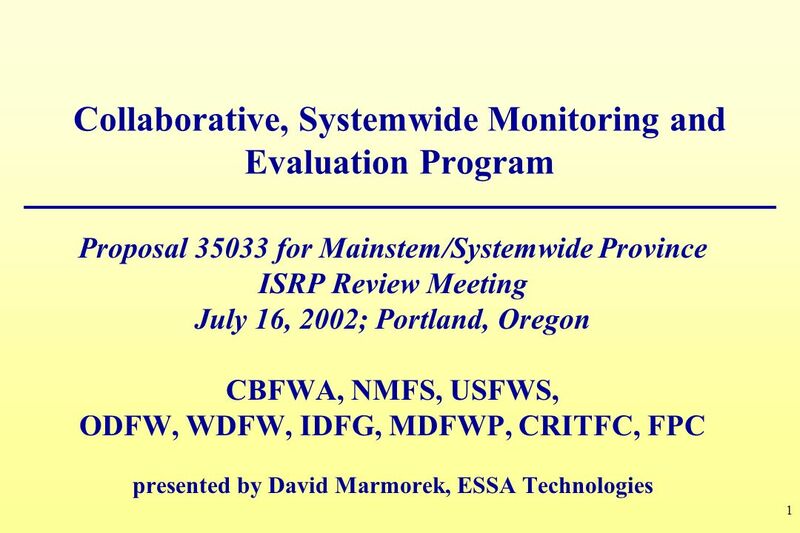 Funding Monitoring in 2006 – the Programs role in a West Coast Partnership November 16, 2005. 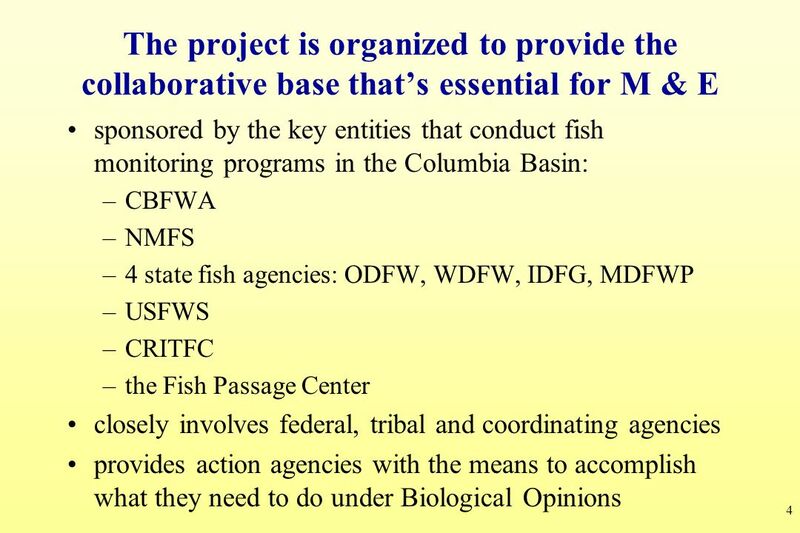 A forum for coordinating state, federal, and tribal watershed and salmon monitoring programs in the Pacific Northwest Pacific Northwest Aquatic Monitoring. 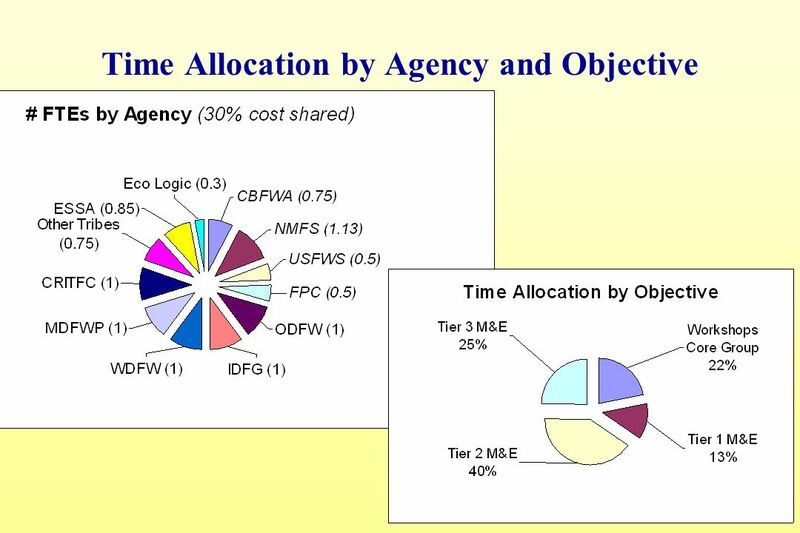 Data Management Projects Data Management Framework Subcommittee Update June 19, 2007. 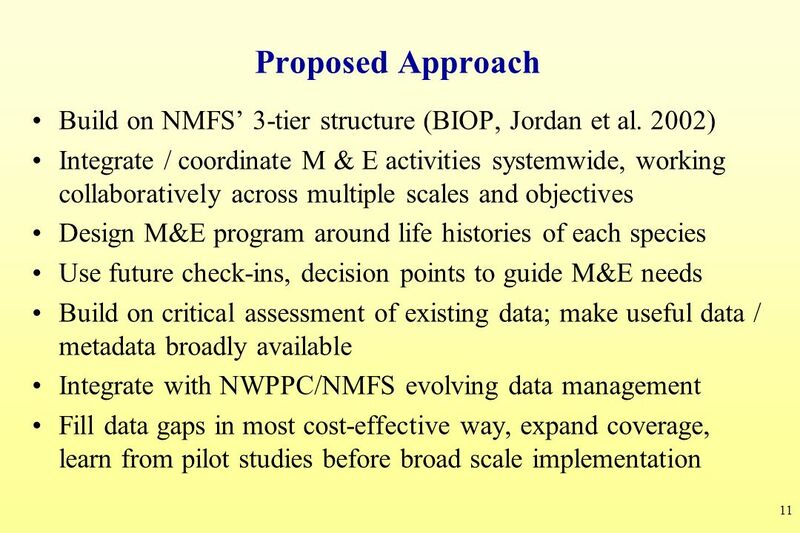 Data Management in Support of the Fish & Wildlife Program Summary. 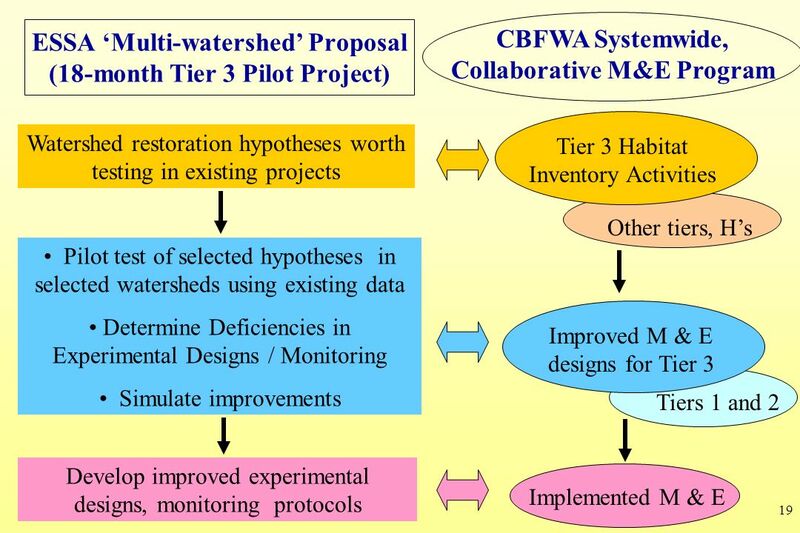 UW Offsite Habitat and Fish Survival Effectiveness Monitoring Objective: Assist in developing and applying central guidance and criteria for improving. 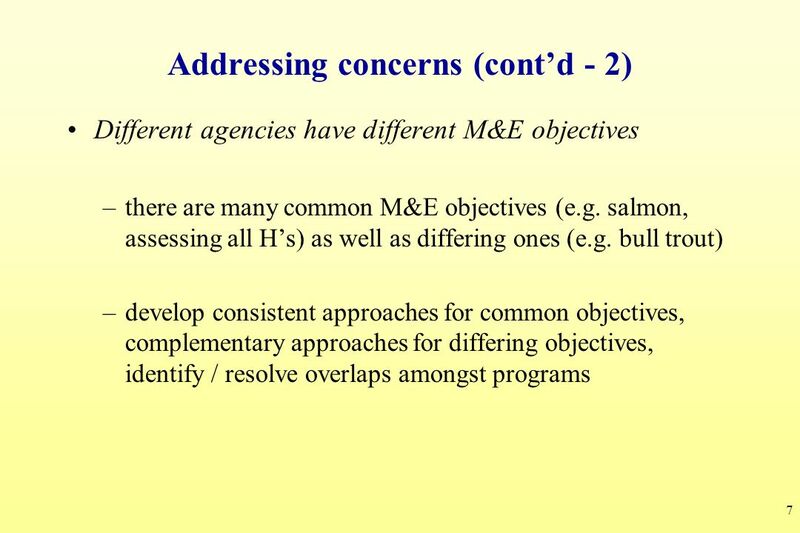 Fishery Management Overview - Context Sponsored By: Colville Confederated Tribes Presented By: Stephen Smith. Analysis of November 2006 Status of the Resource Summary Report Presentation to Northwest Power and Conservation Council September 11, 2007. U.S. Department of Energy Pacific Northwest National Laboratory Evaluation of Juvenile Salmonid Culvert Passage SM Anglea, GD Williams, KD Ham, and GA.
Fluvial Bull Trout Migration and Life History Investigations, Upper Salmon River Subbasin New Project Proposal, No Sponsored by: Shoshone-Bannock. 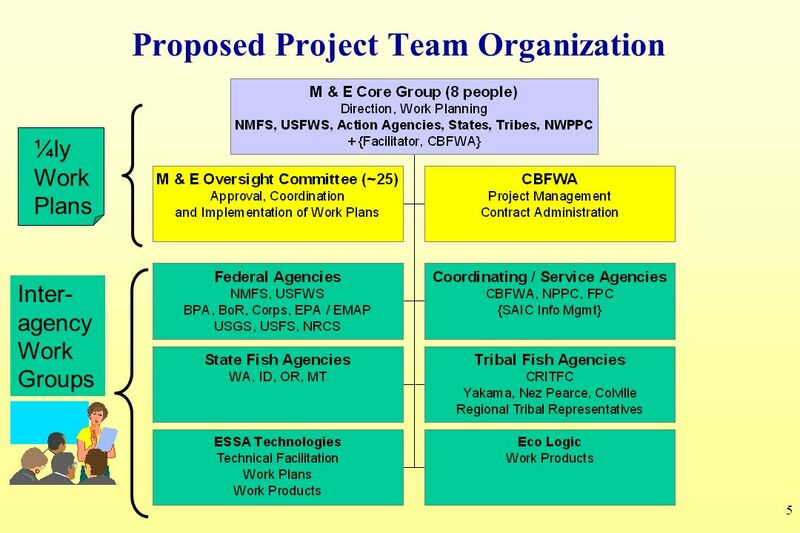 BiOP RPA 52.6 ISAB recommends a regional tagging & marking plan BioAnalysts, Inc.
A forum for coordinating state, federal, and tribal aquatic monitoring programs in the Pacific Northwest Pacific Northwest Aquatic Monitoring Partnership.